With much surprise amongst aviation watcher, the F-104Starfighter was chosen by NATO as their standard ground attack aircraft in thelate 1960s. Surprise because the F-104 was designed as a fast point defensefighter, able to quickly get off the ground and up to intercept incoming enemybombers. Carrying a lot of ordnance wasn't in the original design. However,Lockheed designed an improved version that was to be the F-104G, which was notonly a decent interceptor, but was also to prove to be a good ground attackaircraft. Hard points were installed under the fuselage and wing stations werealso included to carry a variety of ordnance. Other than a few aircraft, most ofthem were built in factories in Europe. A similar aircraft was also licensebuilt in Japan and Canada. It is probably Italy that has gotten the most mileage out of theF-104. In addition to home-built F-104G models, the Italians developed animproved version with a higher powered engine. This was the F-104S. It can bedifferentiated from the 104G by the addition of two small ventral strakes inaddition to the single centerline one. The 104S also has larger engine intakes,stronger landing gear, and larger wheels which require bulged wheel well doors.It was further developed into an ultimate interceptor as the F-104S ASA, whichis still flying. Before Hasegawa released this kit, therewas no lack of Starfighter kits on the market. Revell had done one way back inthe early 60s. Others were produced by Airfix, Matchbox, Heller, and Hasegawaitself in the late 1960s/early '70s. In the 80's a very good kit was released byESCI and a few years later an equally nice one by Revell. Both of these hadengraved panel lines and very good detail. All these were in 1/72 or close toit. In the late 1980's Hasegawa moved thenotch up one more time with a series of F-104 kits covering all of the largerudder versions including the F-104J, G, S as well as the CF-104 and the twoseaters. These modular kits are the best on the market in this scale of thisaircraft. They are highly detailed and include many optional features includingpositionable landing gear and canopy. Unfortunately, it does not includeunderwing weapons, that having to come from the weapons sets! This particularboxing includes parts for both the F-104G, CF-104, and F-104S. The sprue for the104S is marked in red in the image above. The instructions are superb as one expects from the world'spremier 1/72 aircraft kit maker. All variants are noted in the instructions aswell as color call outs using Gunze paint numbers. 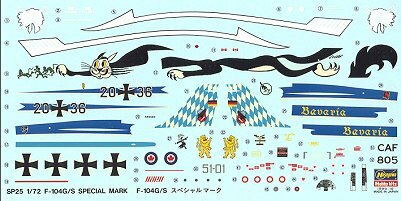 The decals are for three veryspecially painted aircraft. The first is the box art aircraft from 51 Stormo ofthe Italian AF. This is the famous 'cat and mice' unit and this is portrayed onone side of the plane. The other is the standard AMI camouflage scheme. Next isa special scheme from JBG 32 of the Bundeswaffe, and finally, the 'red Indian'scheme of 421 Squadron, Canadian Air Force. All are very nicely done. 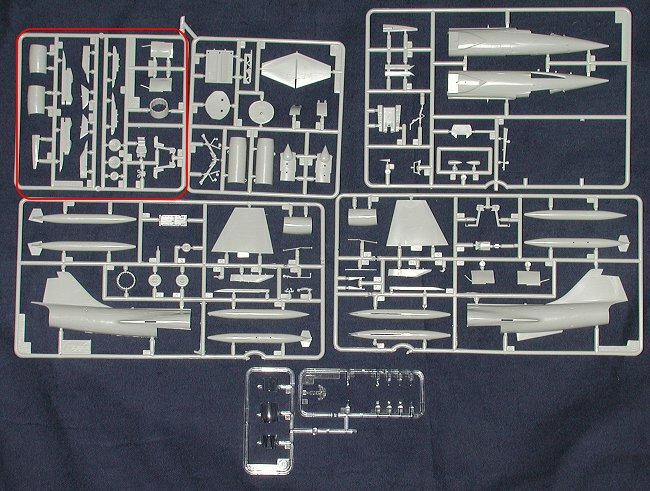 It is this writer's suspicion that much ofthis kit was pantographed up to make the new 1/48 F-104 kit that was recentlyreleased by Hasegawa. Perhaps those who have built both will be able to tell me. Many thanks to my suffering credit card forsupplying the preview kit. If you would like yourproduct reviewed fairly and quickly by a site that has over 1500 visits a day,please contact me or see other details inthe Note toContributors.